If you are a manager or staff member in an urgent care center, walk-in clinic or pharmacy, knowing the difference between patient privacy and patient confidentiality is important, but it can sometimes be confusing. Privacy relates to how a person’s information or data is collected – Patient privacy is the right of individuals to keep their information from being publicly disclosed (either orally or written), and the expectation that personal health information is shared only between themselves and health care professionals. Confidentiality relates to a provider’s obligation to maintain the patient’s privacy with regard to how the information or data is managed – Patient confidentiality guarantees that the information or data that an individual has disclosed, will not be shared with others without the patient’s express permission. By law, patients are always in control of their information and who has access to it, and the patient always decides who, when, and where to share their health information. With the passage of HIPAA in 1996, protecting patient privacy and ensuring confidentiality of information is of the utmost importance to providers. Are you Compromising Your Patient’s Privacy? Even the most careful dedicated health care workers can unintentionally breach a patient’s privacy or disclose confidential information. 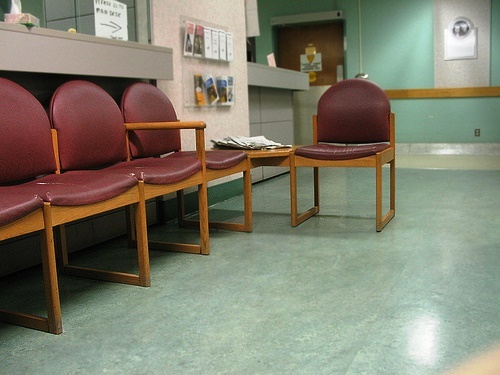 For example, a study done by Cornell University students in the Fall of 2011, found that acoustic and visual privacy at Cayuga Medical Urgent Care Center was an issue. Acoustic Privacy: When patients enter the Urgent Care and queue up to check-in at front registration, they can hear the person in front of them checking in and register. Moreover, there was of auditory privacy at the back registration area, as two back registration stations were located right next to each other. Acoustic quality throughout the waiting and staff area is also problematic, as there is absolutely no acoustic privacy; people in the waiting area can hear everything that is going on in alcove area. On the other hand, interestingly people inside the staff area are completely isolated and unable to hear things outside glass area. This resulting in non-responsive staff, patients had to knock the counter couple times to call the staff. The receptionist who is inside the nurse nook area could not hear the patients until moments later. The isolation and not being able to hear outside also makes nurses, doctors, and staffs not aware that their voices can be heard from outside. Visual Privacy: Glass windows at the reception area allow patients in waiting room to see in. Since the windows are fixed and cannot be closed, patients can hear nurses/ receptionists talk. 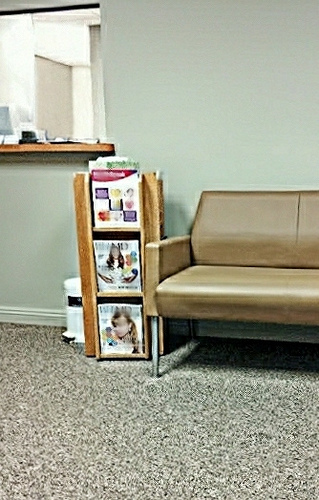 Furthermore, patients can see “Providers” aka doctor board from reception area. Patients sitting at first back station can see across nurses station to front registration computer screen. Clearly, health providers want to do all that they can to ensure that they are protecting patient privacy. For example, as stated in the ANA Code of Ethics, “The nurse advocates for an environment that provides for sufficient physical privacy, including auditory privacy for discussions of a personal nature and policies and practices that protect the confidentiality of information.” That being said, what are some relatively easy, inexpensive and immediate ways you protect your patients’ privacy? Avoid discussing patient care anywhere it can be overheard by those not directly involved in the care of the patient, or by the public. Shield confidential information from public view. 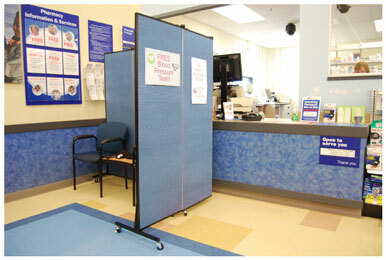 Urgent care, walk-in and pharmacy clinics find using Screenflex portable divider walls an economical solution for protecting patient privacy. And because the panels are sound absorbing, a crucial resource for addressing privacy concerns. Using sound absorbing privacy screening ensures that any interactions or conversations in patient registration, counseling or treatment areas, meet special HIPAA privacy requirements. Using portable divider walls, along with basic training in controlling voice levels, goes a long way in protecting patient privacy in ambulatory settings. Will Antimicrobial Room Dividers Keep You Healthier?